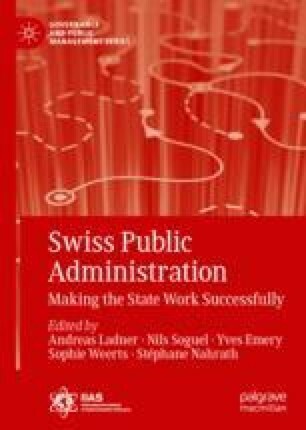 This first chapter provides the contextual framework indispensable for an understanding of Swiss public administration. It starts with a brief look at the bottom-up genesis of the Swiss nation-state and its subsequent expansion through a transfer of competencies from the cantons to the national level. It also highlights the country’s heterogeneity in terms of economic performance, religion, and language and the efforts needed to keep the country together. In a next step, the chapter presents the Swiss state model which falls in-between the Nordic welfare state model and a liberal minimal state. This gives a more accurate picture of the low ratio of government expenditure to GDP. Federalism, direct democracy, and a system of ‘concordance’ are the three cornerstones of the Swiss political system, and all three are based on the principle of power-sharing, and they prevent competencies in decision-making and finances from becoming too concentrated. Germann, R. E. (2002, December 18). Öffentlicher Haushalt. Historisches Lexikon der Schweiz. http://www.hls-dhs-dss.ch/textes/d/D10342.php. Accessed 7 May 2012. Polli-Schönborn, M. (2006, November 6). Zölle. Historisches Lexikon der Schweiz. http://hls-dhs-dss.ch/textes/d/D13765.php. Accessed 30 May 2012.